Over the past few months, EA and Hasbro have teamed up to port classic board games to the Nintendo Wii. And why not? With the Wii being such a casual gamer's paradise, it only makes sense to fill their potential library with casual games. However, where titles like Hasbro Family Game Night are well worth the purchase price, it might have been better for EA to pass on Trivial Pursuit altogether. 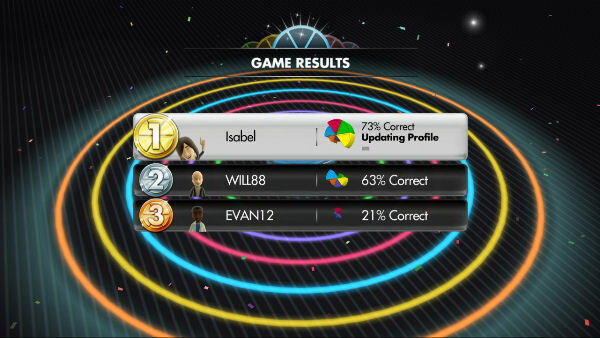 Before beginning the game, you are required to create a profile, complete with name and avatar, for each human player who is taking part, with each specific profile allowing the game to keep track of each player's individual performance. That is, after playing a game, it will give you a detailed run-down of how many questions you answered both correctly and incorrectly and in what category, how many games you've won, lost, and so on. A nice touch, but only for those who will be spending any more than a couple of hours with the game, which, unfortunately, won't be many. When looking at the title from a single-player perspective, the game is altogether disappointing. The only mode available, Clear the Board, has you moving your puck (your game piece) around the wheel-shaped board, answering multiple choice questions in the categories of Geography, Entertainment, History, Art & Literature, Science & Nature, and Sports & Leisure. After you answer a question, that particular space is out of play for the rest of the game, until you have answered enough questions to literally clear the board of all remaining spaces. While the Clear the Board single-player mode is an interesting take on the Trivial Pursuit template, the inability to play classic Trivial Pursuit with only one real life player (that is, played against AI opponents) is a disappointing oversight that could have really made the game stand out. While many would argue that playing the game against computer players would put the human at a disadvantage, a simple IQ tier could have corrected this potential problem, with gamers being able to choose how intelligent each AI player wound up being. 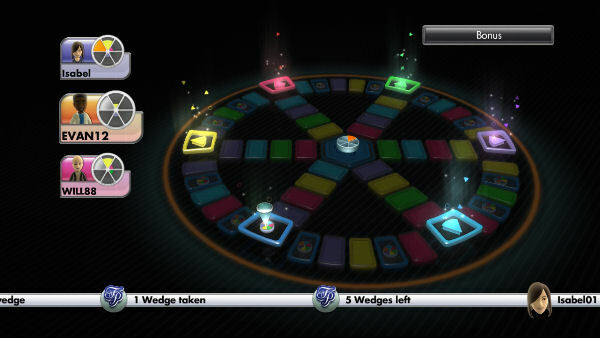 The game's disappointing single-player notwithstanding, the multiplayer modes do allow for classic Trivial Pursuit gameplay, with each human player setting out to collect a colored wedge from each of the six larger wedge pieces on the board by correctly answering a question after landing on said spaces. That being said however, the board is filled with other colored spaces that contain no wedge earning potential, so after just a few rounds, even this mode, as with Clear the Board, takes on a bit of a pointless quality, as you waste dozens of questions in trying to get to the wedge spaces that actually count for something. Rounding out the package is Facts & Friends, the second multiplayer mode available for play by two or more human players. In Facts & Friends, the game becomes much faster paced, with all players sharing the same puck and fighting to see who can earn as many wedges as possible to fill that puck. 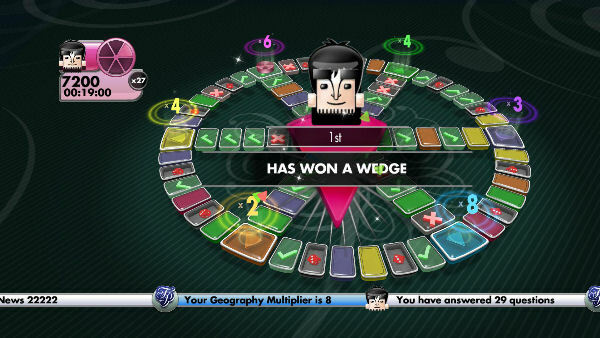 Each correctly answered question only grants you a portion of each wedge, making the mode more competitive as two players race to complete the same colored wedge first. The real fun in this mode comes with the ability to bet on the performance of your friends. After everyone has had a chance to read the question, other players are allowed to bet as to whether the active player will know the answer, will guess the answer incorrectly, or a third option, that being that your friend will guess incorrectly, but you happen to know the answer, and therefore can steal their section of the wedge when they answer the question wrong and you get it right. If you predict the question's outcome correctly, you too earn a piece of the wedge, leading to the possibility of sudden death situations, when two players (say, the active player and one of the challengers) complete the same wedge at the same time. In these instances, the main gameplay pauses to focus on these two players, as they take turns answering true or false questions until only one person screws up in a round (think spelling bees). Other special spaces are added to the board in Facts & Friends mode that, once landed on, try to add to the party game feeling by allowing you to teleport to any space on the board, steal wedges from friends, double the points earned for subsequent questions, and so on. Once the puck has been filled, the number of wedges each player contributed to the completed puck becomes their available amount of lives in "The End Game." 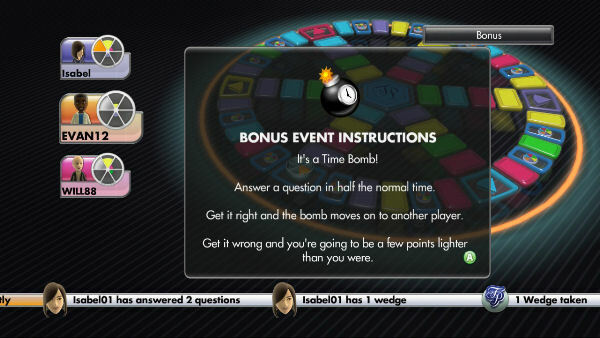 In the End Game, each player answers the same question at the same time, with answers being assigned buttons on the Wii Remote so that no speaking is necessary, and no one will know who guessed what answer until everyone has had a chance to do so. Play continues until only one player is left with a life. Needless to say, Facts & Friends is easily the most complex mode of the three, and also happens to be the most fun, even though that's not saying much, as no matter which mode you choose to partake in, all are plagued by the same ridiculously difficult question pool. 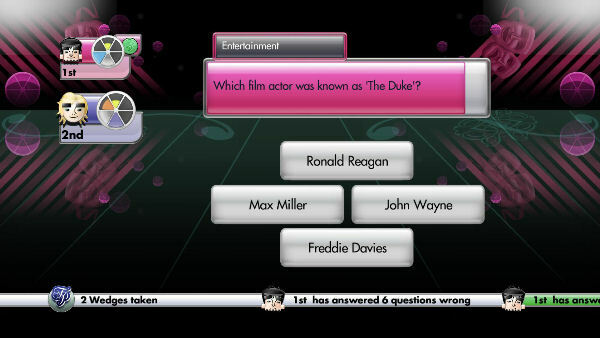 While no one would expect a game of Trivial Pursuit to be easy, the questions here have simply gone too far to the side of genius, requiring knowledge over finite details that the average individual simply wouldn't possess. Even questions in the Entertainment category (which covers TV, Movies, Music, and other forms of pop culture), the category that many would consider to be the easiest, are now far too intricate, forcing you to know the exact train platform number a character boarded in a movie, or which city a certain scene in a film was shot in. And it's not just the entertainment category that suffers. The Sports questions seem to require that you've read every sports almanac cover to cover, while the Science questions demand that you've memorized the entire periodic table or can quote Isaac Newton or Thomas Morgan on the fly. There's a joke in that last sentence. Don't see it? Welcome to the specificity of the questions in Trivial Pursuit: you'd have to be a specialist in each field, or very comfortable with your own intelligence (or, as the game will soon make you feel is a lack thereof) in order to get any real enjoyment out of the game. And unfortunately, as with other board game titles EA has churned out for the Wii (Monopoly, I'm looking at you), the text here is incredibly tiny and hard to read, the graphics, while bright and colorful, are bogged down with too many extras that slow down gameplay, like moving, distracting avatars and lengthy puck animation sequences that show your puck moving from space to space around the board in the form of a rocket, an insect, a warping disc, and so on. Creative? Yes. Necessary? Definitely not. Annoying? Most certainly. The sound effects fare no better, and are filled with what the game apparently considers to be helpful dialogue blurbs by a faceless narrator, who often comments on the game's happenings, expressing either his satisfaction or disappointment in each player's performance, or spouting off the same few phrases that are repeated far too frequently to not affect one's sanity. While I would love to say that Trivial Pursuit continues in the successful line of board game to video game transitions that EA has released since last fall, instead the exact opposite is true. 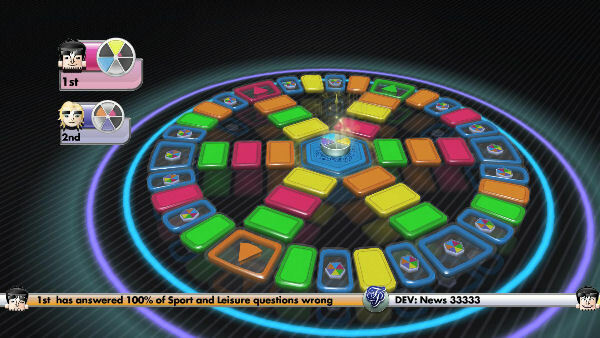 With a lack of even the most obvious of gameplay modes as an option for a single-player experience, Trivial Pursuit falls flat on its face right out of the gate, with a ridiculous question pool doing nothing to help matters. This is definitely one case that proves that going digital isn't always a good thing.